A metal camping tumbler from HSN will keep that coffee hot long after you pour it in. There is nothing quite as refreshing as drinking an ice cold beverage after a long hike or run. A metal camping tumbler will keep cold drinks nice and frosty while keeping hot drinks toasty warm. It is game day and you and your friends are having a fun tailgate party on a snowy afternoon before heading into the stadium to cheer your team on. 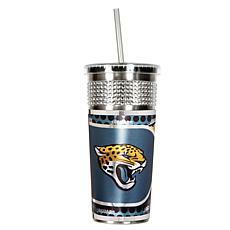 Keep your coffee, hot tea, or hot chocolate nice and warm with a metal camping tumbler that proudly bears your team's logo. Show your team spirit with a fleece throw that also shows your club's logo. A metal camping tumbler makes a great gift for someone who commutes and needs to have their beverages just the right temperature while on the way to work. They will be able to sip their drink easily with the convenient metal straw. Add a bag of gourmet coffee to their gift and they can enjoy the fine beverage on their ride to work. Pick up a metal camping tumbler for you and your friends when you shop HSN today.